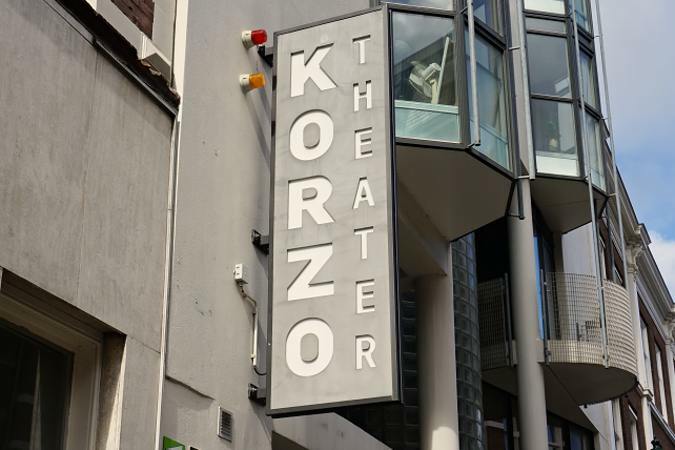 Korzo is an intimate and adventurous theatre in the old town centre of The Hague. For more than thirty years, Korzo has been a leading venue for music, dance, theatre, and of late, also for contemporary circus. Korzo’s programs bring the public close to the talents of today and tomorrow. Upon entering the theatre, the most common reaction is one of mute astonishment. Then the words follow: that there is such a place in The Hague! Who designed it? What does the intriguing design on the interior wall mean? Who works here and what goes on here? For the public attending a performance, the course of an evening in Korzo is difficult to predict, but anyone who accepts the challenge will be surprised. Korzo invests in young talent and prefers to make performances and events for everyone who is willing to look past the end of his nose, for people who have a pronounced curiosity and are up for an out-of-the-ordinary evening at the theatre. And as an extra bonus you can meet artists from al over the world in the relaxed atmosphere of the Korzo bar.